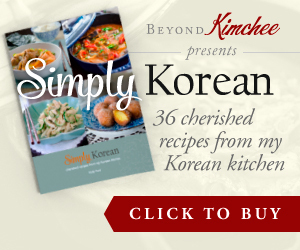 You are here: Home > Archives > Recipes > Easy and Simple > Kimchi Gratin or Kimchi Casserole??? Kimchi Gratin or Kimchi Casserole??? I liked the movie, “Julie vs Julia”. It is a true story about a woman named of Julie challenged all the recipes of Julia Child’s first book in one year and blogged the process. My blue eyed husband suggested that I should challenge making different types of Kimchi everyday for one year and blog about it. I still don’t know if he was serious or joking. Well, for his sake, I am not making Kimchi everyday nor every week. But.., I can come up with 365 Kimchi ideas though. There are so many dishes you can make with Kimchi, not only to authentic Korean dishes but also to fuse with other cuisines as well. Possibilities are limitless and creativity is all you need. Here is one dish that I really love.., but can’t decide what to name it. Kimchi gratin? Kimchi casserole? 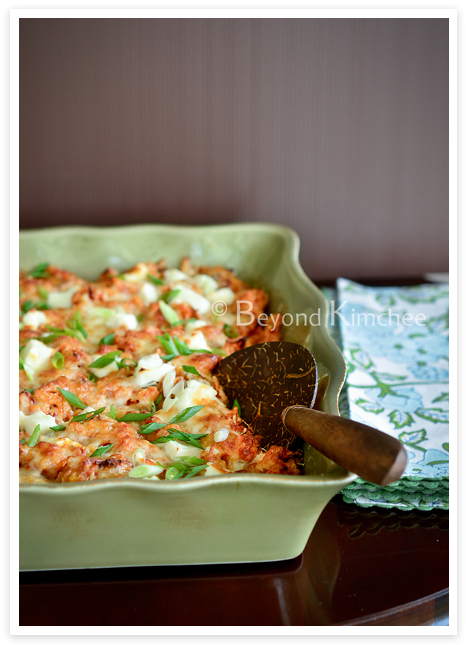 or maybe Baked Kimchi rice? I will let you name whatever that sounds good to you. 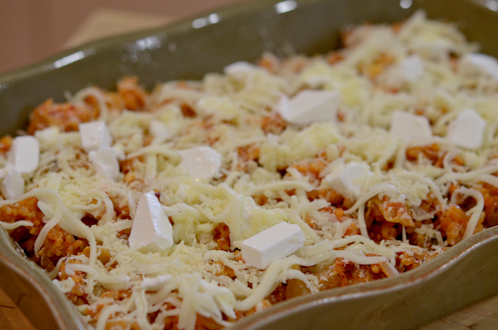 Kimchi goes so-so-so well with cheese, especially with the cheeses of Mediterranean. 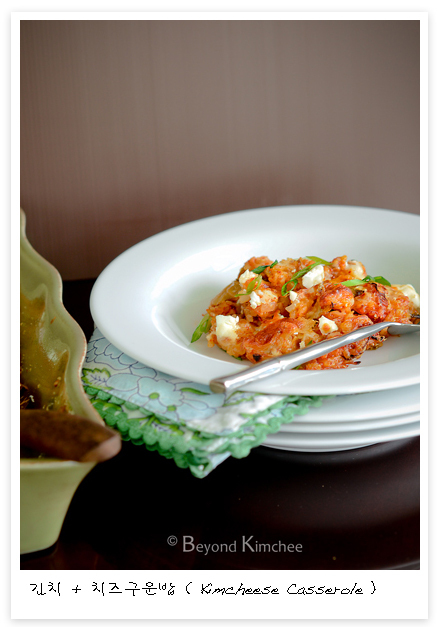 I used feta, mozzarella, Parmesan cheese, and mixed with Kimchi fried rice, and baked in the oven. You can add some minced pork or chicken, ham, or sausage to add protein if you desire. It is very delicious and comforting. Serve as a side dish or as a main with some salad on the side. Who knows? This might be the next hot thing in the food trend. Here is the last piece of cabbage kimchi in my fridge. Quite fermented.., perfect for this recipe! Shake her up gently over the sink to get rid of some stuffing inside. Need to feed to those who can’t handle the spiciness? Give a little rinse with water to get rid of some chili factor. 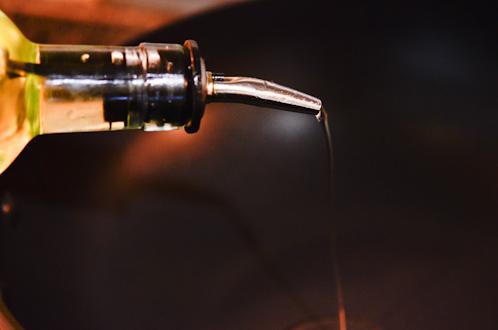 Drizzle a little oil in the skillet over medium heat. 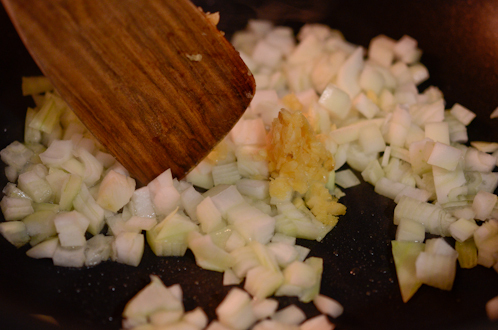 Saute chopped onion and some garlic for 2 minutes. NOTE : Add some minced pork at this point to make a complete one dish meal if you wish. 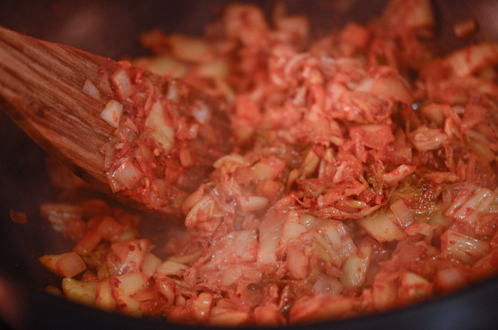 Add the chopped kimchi and continue to cook until it gets tender, about 5 minutes. 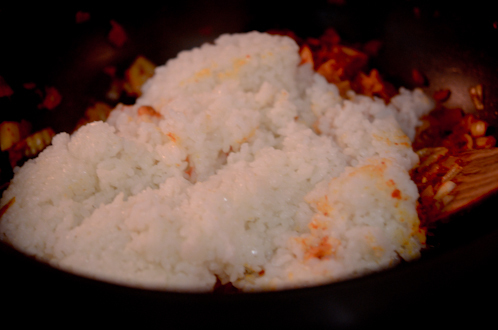 Add rice and toss together until well combined. sesame seeds, and toss well. Remove the skillet from the heat and set aside to cool down a little. 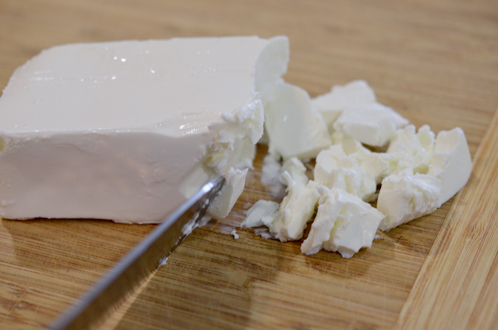 Meanwhile, break apart your feta cheese into small chunks. 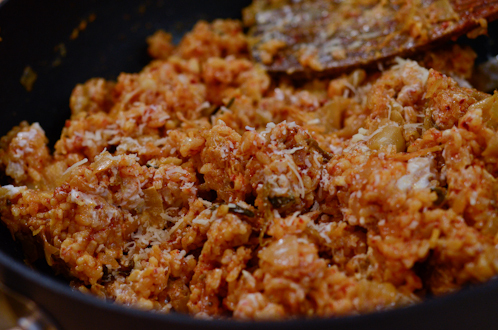 Add half the amount of cheeses to the kimchi rice mixture and toss all together. 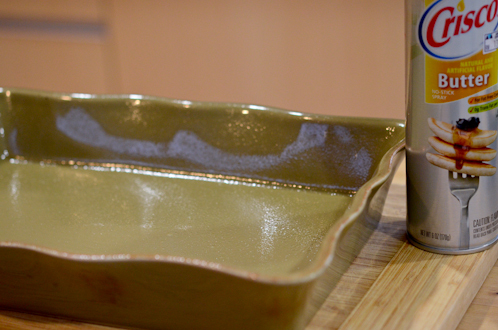 Now, get a pretty baking dish, about 9″x13″, and grease with oil spray. Put the mixture in the dish and spread the rest of the cheeses on top. 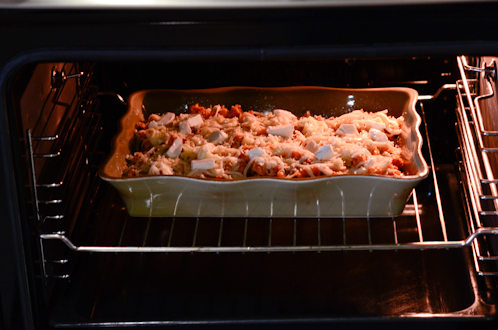 Bake in the preheated oven at 350º F (160º C) for about 20 minutes or so until cheese melts and creates golden crust. Here! They just came out of oven. Sprinkle some sliced green onion on top for the look. and dig in when it’s still hot. You might find yourself falling in love with cabbage all over again. Why? Because it is sooooooo dang good! Maybe I should call it “Kimcheese Casserole”. Heat oil in a skillet over medium heat, saute onion, garlic, and pork (if using) for 2 minutes. Add the chopped kimchi and cook for 5 more minutes until kimchi gets tender. 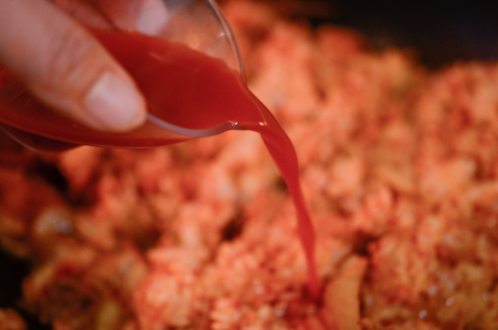 Add the rice and kimchi juice, stir to combine. Sprinkle sesame seeds and mix well. Remove the skillet from heat and set aside to cool down a little. Add half the amount of cheeses to the skillet and toss to combine. 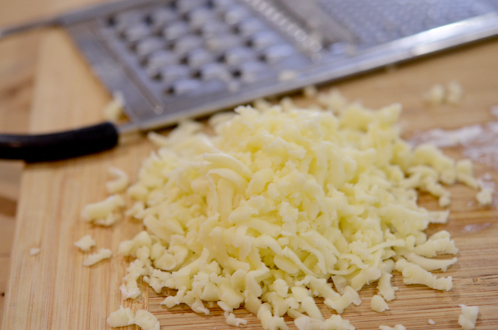 Transfer the kimchi cheese mixture into a greased 9”x13” baking dish, spread the rest of cheeses on top. Bake for about 20 minutes or until the edges and the top gets golden. Sprinkle green onion on top while it is hot. Serve hot as a side or as a main dish. I like the sound of Kimchi Casserole. Looks delicious! oh my my my! i am practically drooling right now. i need 신김치. all i have in my fridge is just 풋배추 김치. thanks so much for sharing this amazing recipe! oh my god, it's funny, yesterday I saw this movie for the second time and thought the same about me :) one of these days I plan on my blog so ehehe I tell you this dish is great looking! Yammy! Oooh looks delicious! Thanks for the great idea! Wow, that casserole looks so interesting. I love kimchee. I like how you included so many photos of the process. I can't wait to try this. 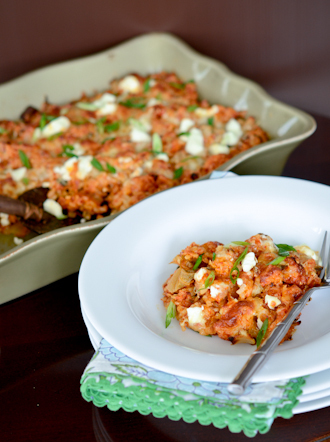 I love this idea - kind of like a korean take on the traditional chicken & rice casserole. 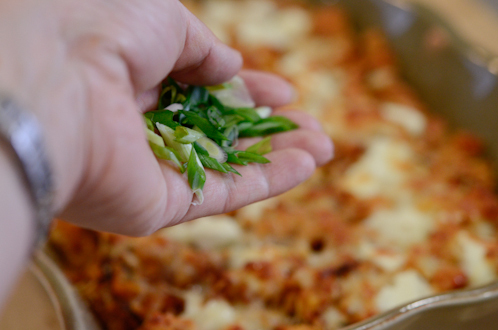 Love how you made a Korean dish into a casserole - something Koreans would never do because they don't use the oven! My mom put her pots and pans in there. I really cannot wait to give this a try. I'm sure I will love it! Ha ha! I had to laugh a little when I read your mom stores pots and pans in the oven. You are right, oven is not usual thing in the Korean cooking, but these days, many Korean home cooks use their oven to create fusion dishes. Go for it. Anything is worthy of blogging. 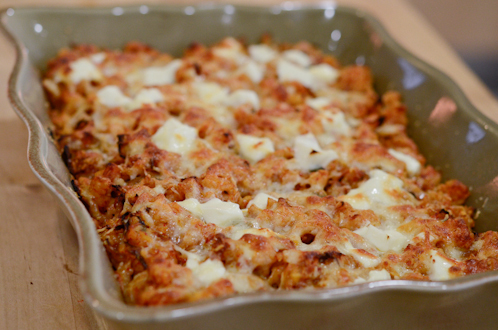 I really like the sound of a cheesy kimchi casserole! http://www.amateurvagrant.com/2012/02/kimchi-new-yogurt.html, but my blog is a personal blog and not a cooking blog!) I know I will be spending a lot of time here! Thanks! Such an inventive recipe! Love the flavors - I think I'd call this a gratin, but I bet however you name it, you'll call it delicious! 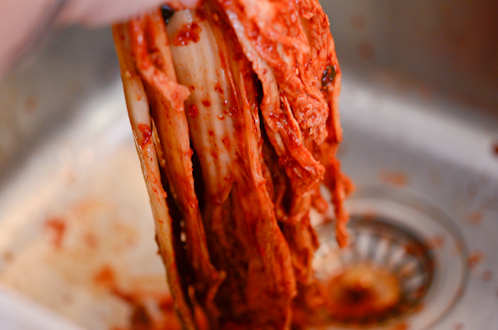 I have a shocking confession - I've never made kimchi! Weird, because I like it - just have never made it. Reading your blog is an inspiration, though, so I'll be making it later this year. Anyway, thanks for this. Hope you can give it a try to make Kimchi. It requires some work, but lots of fun as well. Thanks always for your uplifting comments. Hi Jo, I love to see this post on foodepix. Please let me know what I can help you with. nice recipe , the step by step procedure is surely clear. thanks for the great explanation.. Thanks you Jane. You have a wonderful day, too! Hmmm.., cranberries sounds very interesting. I've never had Kimchi doria but I am sure many Koreans enjoy their kimchi with cheese. Thanks. OMG, this sounds like it would go straight to my heart! As a favorite comfort food that is!!!! Great post hon. Love your blog and you've almost convinced me I CAN make homemade kimchee that won't wipe out my whole family. Thanks Susiet. 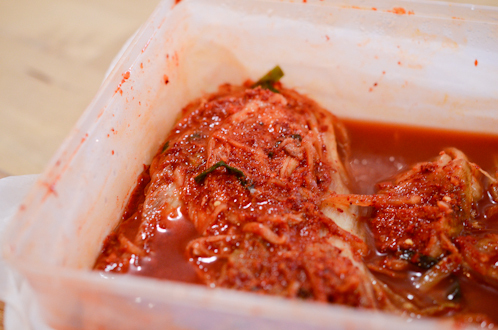 Hope you can try making homemade kimchee someday. Congrats on making Blog of Note! 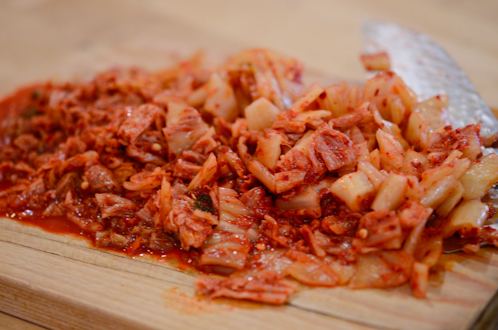 Ohhhh emmmm kimchi...LOVE your blog!! 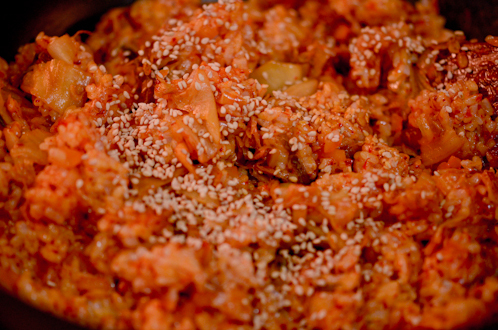 Definitely have to try this recipe and get my Dad to eat kimchi (he hates it). He won't even know it's in here. Newest follower. Brilliance!! Hmm .... So yummy !! Hi Holly! I'm guessing it doesn't, but does dairy bother your stomach at all? My mom and I can hardly eat cheese or drink milk or anything like that without getting very upset stomachs. Not at all. You and your mother must be Lactose intolerant. I am lucky to have an iron stomach. I made this yesterday with Kimchi from your blog and the few changes I made was to up the garlic to 4 and I used Gruyere rather than Feta as that is what I had on hand. It was really delicious. Thanks for sharing! Gruyere is great. I am sure it made the casserole more cheesy. Happy to hear that you liked the dish. Tried this tonight for a dinner party. Was an absolute hit! Thank you for sharing. Great! So glad to hear that. 365 kimchi recipe?? kimchee(se) casserole?! Pure brilliance! 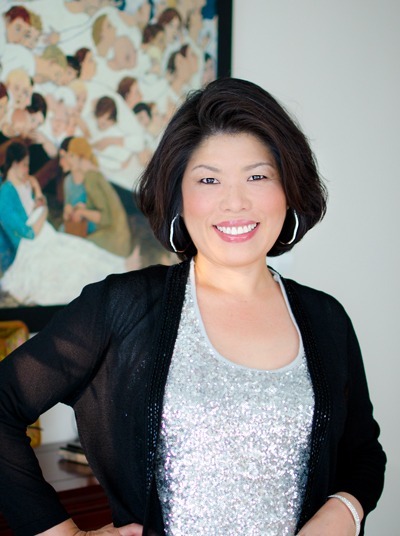 Holly -- I discovered your site while searching for a cucumber kimchi (kimchee!) recipe -- we have a *million* cucumbers. Then I came to this recipe -- in a million *years* I would never have thought to put kimchee with cheese -- that is genius! Can't wait till I get room in the fridge for a new batch of kimchee, so I can let it ferment and make this rice with some feta.... yum :):) All the best from the north woods! That is so great! I glad that your family enjoyed. Thanks.